We had a wonderful month with two amazing events and a combined 400 attendees. This week we had our first Startup Fair and both the general audience and the investors got to vote for their favorite startup on the expo floor. The event was a lot of fun to organize and even more rewarding to see all of you there. For those that missed the event our awesome video production partners, Triodyssey, was kind enough to film the first three panels and will make the footage available for you all shortly. Now, on to announce the winners! To Soan and Partysserie for helping with logistics and support. To Ryan Azlein, of Stradling Attorneys at Law, for getting the ball rolling on this event by putting together his panel. To KiwiTech, Xivic, and Crowdfunder for taking the lead on providing supporting capital and prizes to put on a more impactful event for you all. To Triodyssey for filming our panels. 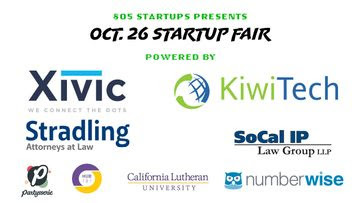 and to our long term sponsors for continuously supporting us and the startup ecosystem we are all a part of: Stradling Attorneys at Law, Numberwise, and SoCal IP! We had a great lunch today with our VIP members. It was at a new restaurant in the Thousand Oaks Mall called, Deliteful Meals. The food and space definitely stood up to the name. It was surprisingly delicious. Especially, when you take a moment to consider all the food was gluten free. I’m not sure how much experience you have with trying gluten free food but, it usually doesn’t stand up to regular food. haha. If you’re interested in a new place to try that is fresh, healthy, and outstanding we suggest you give them a try for your next lunch or dinner. They also have music performances Friday and Saturday nights, starting at 5:30pm! Again, special thanks to Soan and Partysserie for helping with this event, thanks to Deliteful Meals for providing their space and food, and thanks to our sponsors!